Larger supplies are indeed a big factor. Beef cow slaughter has been running above year-ago levels for nearly all of 2018. 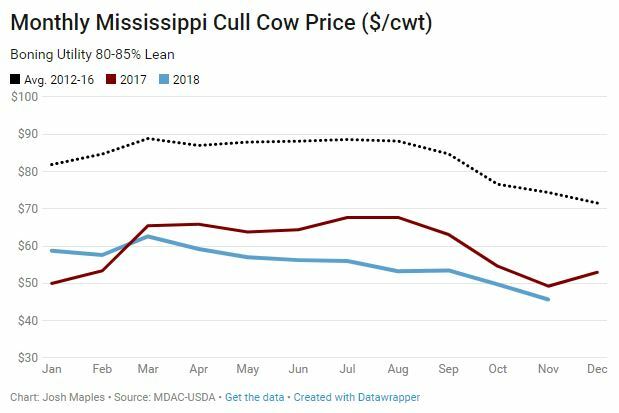 USDA-AMS reports about a 12 percent increase in the number of cull cows and bulls sold since the beginning of July 2018 when compared to the same period last year. Some of this is due to a larger U.S. cow herd leading to there simply being more potential culls. Low margins for dairy producers forcing more dairy cows into the slaughter mix is another factor. While prices have been low already, we are now in the time of year when we typically expect lower cull prices. Cow slaughter is seasonally higher during the last three months of the year as producers make cull decisions prior to winter. Combined with winter usually being a slower ground beef demand time of the year, there usually is not much cull market strength until we get closer to Spring. This dynamic makes cull decisions a little more complex this year for many producers. Wintering a cow that you do not plan to keep is generally something producers are not keen to do. But that may not be the case in certain instances this year – especially for producers who have been waiting for a cull price rally to sell over the past few months without reward. Culling, even at current prices, will still make sense for many (probably even most) producers once the cost of carrying a cow through the winter is considered. But for producers with relatively low marginal wintering costs, this is at least a year to crunch the numbers.